A hybrid gladiolus with broad leaves and long spikes of flowers in a range of colours, often streaked and marked with contrasting colour. The accompanying figure shows flowers with ground colours of white, pale yellow, pale pink through to deep red. ‘The G. gandavensis of gardens is a cross between G. oppositiflorus and natalensis; so also is the G. ramosus of the gardens, between G. oppositiflorus and cardinalis or cardinali-blandus. Van Houtte, who first raised gandavensis, stated that it was a hybrid between G. cardinalis and psittacinus, which is the same as natalensis.’ [BM t.7292/1893]. Louis Van Houtte’s Gladiolus gandavensis is figured at FS pl.I 3e Liv./1846, and the variety citrinum, with yellow flowers, marked with red on the lower petals, at FS f.539/1849. This plant is a late flowering gladiolus with broad leaves and long spikes of bright red and red-yellow flowers, streaked and marked with contrasting colour. A plant figured as Gladiolus gandiensis has brilliant orange-crimson flowers, yellow on the lower segments, shaded with crimson. ‘Probably received its name from having come from Ghent to this country.’ [MB p.27/1844]. 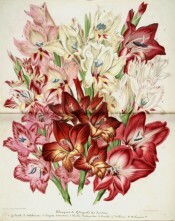 The term ‘first raised’ [by Van Houtte] is certainly incorrect, as William Herbert attests: ‘The Gladiolus called Gandavensis by Mr Van Houtte, of which he is stated to possess the whole stock, was raised abundantly by me, being the produce of G. oppositiflorus by Natalensis, but it did not thrive as those raised in Belgium. Some, however, which were raised as early by Mr. Bidwill in this country, and taken by him to Sydney, far exceeded the Belgian plants in growth and vigour, and the roots thereof brought back by him from thence flowered with greater strength than those for which I am indebted to Mr. Van Houtte.’ [GC p.133/1844]. The Latin ‘Gandavensis’ translates as ‘from Ghent’, and, although originally coined for Van Houtte’s hybrids is now used as a name for all hybrids of this parentage, including those raised by Bidwill in England and at Camden Park. Gladiolus x gandavensis is a parent of most modern gladioli. Listed in the 1845, 1850 and 1857 catalogues [B.139/1845]. The plants grown by William Macarthur as Gladiolus gandavensis are not of Belgian origin but originated with the plants brought to Australia by Bidwill, particularly his hybrid ‘Mary’, probably supplemented with new hybrids raised at Camden. Macarthur makes it clear in a number of letters that the plants he grew and distributed as G. gandavensis were of his and Bidwill’s breeding: ‘The variety is not the one raised in Belgium but one from the same parents in England about 8 years since by Mr. J. Bidwill.’ [MP A2933-1, p.128]. 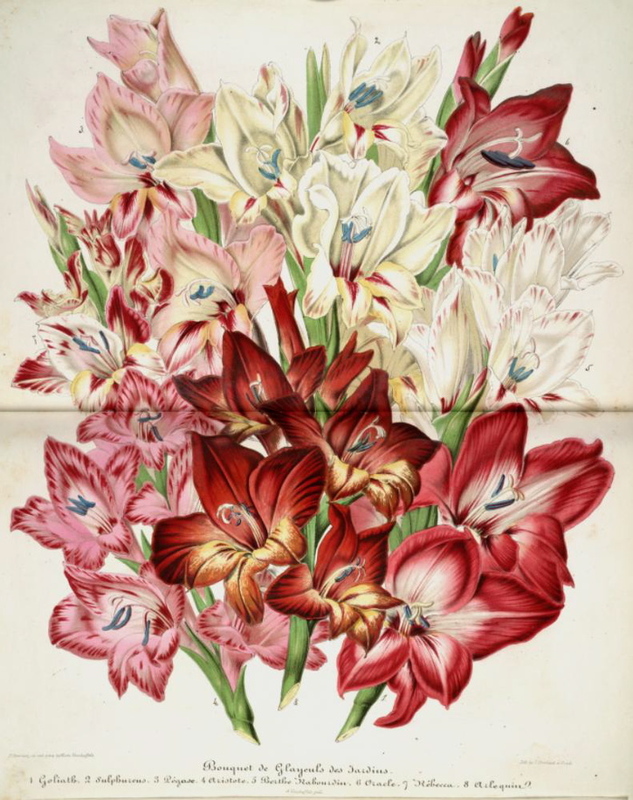 A large number of the Camden Park hybrids were sent to England, to William Herbert just before his death, and to commercial nurseries, and it is quite possible that these reportedly superior plants contributed to the later development of the florist’s gladiolus in England.